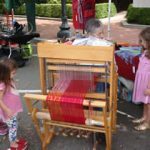 The Potomac Fiber Arts Guild promotes excellence in design and fine craftsmanship in the fiber arts. 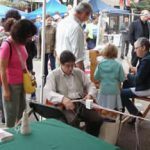 It is especially interested in providing educational opportunities for its members and the general public to further their skills in, and appreciation of, the fiber arts. Under the direction of Erika Cleveland, a group of guild members worked on a flip-doll project with homeless women of the N Street Village in downtown DC. Using materials provided by Erika—fabric, photo transfers, yarn, embellishments—each woman created her own unique flip-doll. Members guided them in choosing materials, using the sewing machine, and hand sewing their dolls. The conclusion of the project was an exhibition entitled, Reinvisioning the Flip Doll: Exploring our Connections, at the Artists and Makers Gallery in Rockville, MD. One woman was thrilled to sell her doll to a visitor at the opening reception. Some guild members also exhibited dolls they had made during the sessions at N Street. Erika was aided in this project by receipt of a Conant Grant from the Guild. A hand spinner discussed Colonial cloth production and demonstrated hand spinning at a local elementary school. Each student received a sample of natural-dyed, hand-spun yarn. 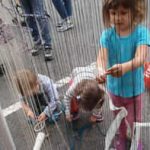 Several members prepared a Community Loom for the Takoma Park Folk Festival. 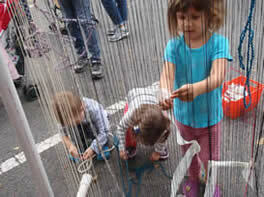 Visitors were able to try their hand at weaving, regardless of skill level. 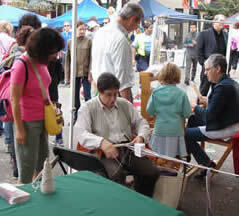 Others demonstrated needle felting at The Textile Museum’s Celebration of Textiles Day. Knitters and crocheters in the Guild teach in many settings, from schools to homeless shelters. 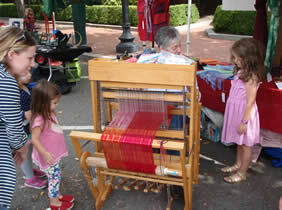 Beaders, rug hookers, felters, and weavers lead workshops. Members have taught art journaling and bookbinding. Art quilters display their work in many settings. A study group recently taught scarf dyeing to a group of seniors. A crocheter demonstrates each year at the Montgomery County Fair. A sheep farmer shares the cycle from birth to fiber. One of our members is experimenting with social media to encourage interest in fiber arts. Members of the Guild knit and crochet hats for the homeless, blankets for wounded warriors at Walter Reed National Military Medical Center, and shawls for those who are ill. The Guild grows and learns when it listens to its members. If you are sharing your fiber art skill with others, we are interested in your experience. If, on the other hand, you need help figuring out how to move forward with a project, contact us. The experience of another Guild member may help you.